Students learned how motors work by building their own working models. The original plans called to use button magnets, paperclips, foam cups, insulated wires, and batteries. The students soon discovered that there are a wide variety of problems with this initial design. They soon decided to change variables within the design. The insulated coils were changed to bare wires coils. The magnets were changed to a more powerful ceramic magnet. The amount and position of magnets also changed how motors operated. The types of batteries and amount of batteries used changed. Most important, they discovered that the cradle that the coil rested in worked best if made of wire instead of paperclips. Another important factor in successful operation of the motor was marking one top side of the coil's extending wire with a permanent marker....doing so allowed the coil to turn on and off and allowed the coil to spin freely. Grady: He was the first to have an operational motor. 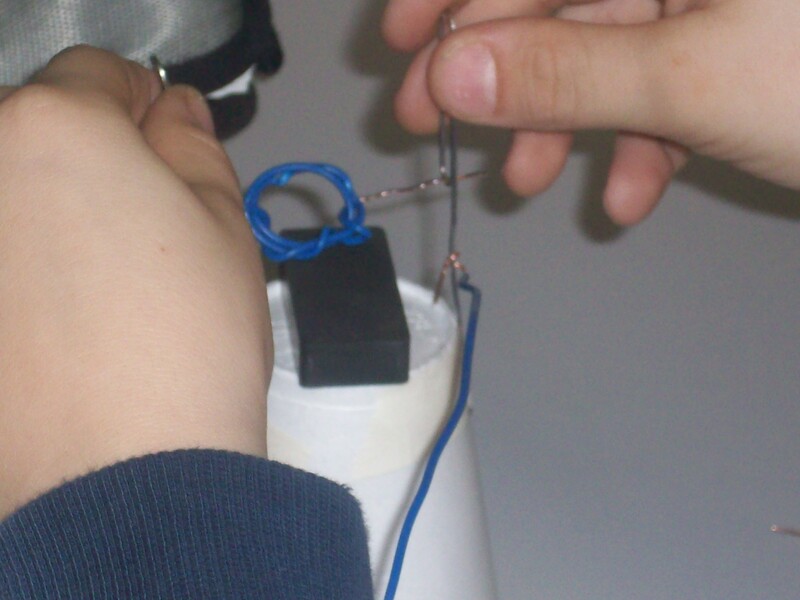 Nick: He and his group built a quick running motor with lots of magnets and was the first to use wires instead of clips. Megan: Megan researched an alternate design with the magnet resting on the battery.